The Oclawaha River runs next to the Wilderness RV Park and through the Cross Florida Greenway. 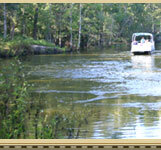 The RV Park is only a quarter mile below the junction of the Ocklawaha River and the crystal clear Silver River. The Ocklawaha River retains some of the clarity of the Silver River as it passes the park. We offer Canoe, Kayak and Pontoon boat rentals on the Ocklawaha River. The pontoon boats are perfect for exploring the Silver River in search of swimming, snorkeling and wildlife viewing, even the famed Silver Spring monkeys. The Ocklawaha River is a pristine wild river that is made for exploring by canoe and kayak. The Ocklawaha River has unmatched beauty. The river is canopied by cypress trees festooned with spanish moss. The Ocklawaha River is unmarred by houses or development. The wildlife along the river includes otters, alligators, bears, deer, boars, turkeys, and even bobcats. The Ocklawaha River is fed by numerous lakes in Central Florida and is the largest tributary of the St Johns River. The Ocklawaha River gets its name from the Creek tribe's name for "muddy", ak-lowahe. Native American artifacts have been found along the Ocklawaha River from over 3,000 years ago.